The year 1984 may be famous — especially amongst high-schoolers — for the angst of Winston Smith. He’s the guy trying to cope with illegal daydreams of individual freedom in the repressed collective created by George Orwell. 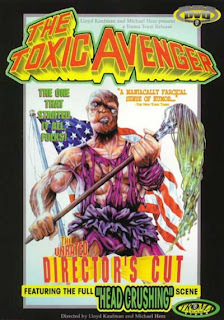 But 1984 also brought “The Toxic Avenger,” a low-rent cinematic romp with environmental themes. Described as an action comedy horror film, it broke new ground by being surprisingly entertaining and launched the B movie careers of directors Lloyd Kaufman and Michael Herz. Mitch Cohen, who later appeared as a bit player in Kevin Smith’s incomparable “Clerks,” stars in Toxic as Melvin, the Tromaville Health Club mop boy. Cohen’s Melvin “inadvertently and naively trusts the hedonistic, contemptuous and vain health club members, to the point of accidentally ending up in a vat of toxic waste,” says Cinema Fan on imdb.com. This entry was posted on Thursday, July 19th, 2012 at 6:41 pm	and is filed under News. You can follow any responses to this entry through the RSS 2.0 feed. You can leave a response, or trackback from your own site.